It is the second largest station in Barcelona - after Sants - and number one when it comes to monumental and historical value. Known by the name of “Barcelona-Término” up to 1988, Estació de França was built at the beginning of the 20th century and was one of the city’s first connections to Paris. Officially opened in 1929 for the Barcelona International Exposition, Estació de França is an outstanding monumental building on Avinguda del Marquès de l’Argentera, in the Born neighbourhood. Designed by the engineer Andreu Muntaner and the architect Pedro Muguruza, the building was a joint creation and features a dual metal canopy with windows that allows a dramatic play of natural light on the 12 tracks that make it up. It is one of the most important examples of Modernista iron architecture in Barcelona. Another beautiful feature is the Noucentista foyer with three enormous domes, designed by the architect Duran i Reynals, to extend the building. The presence of high quality materials such as marble and bronze, both in the noble foyer and the rest of the station, enhance the spectacular appearance and distinction of the station, which is often compared to Orsay Station in Paris. 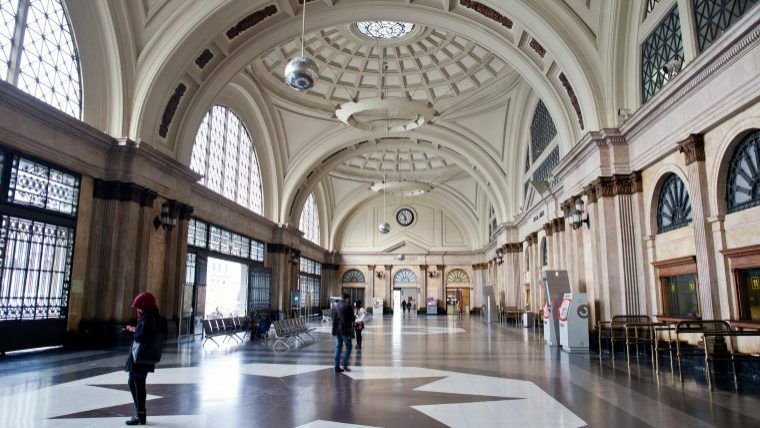 After some thorough remodelling, the station reopened in 1992, to mark with the Barcelona Olympic Games.